This article reports on an investigation of the speech recognition benefits of four commercially available remote microphone systems, each with a different wireless audio transmission protocol. Sixteen participants (6 males, 10 females) aged 52 to 81 years old with mild-to-moderately severe sensorineural hearing loss completed the adaptive version of the Hearing in Noise Testing (HINT) while seated both 6 feet and 12 feet away from the talker loudspeaker. Participants were fit with three different sets of bilateral hearing aids and four remote microphone systems (FM, 900 MHz, 2.4 GHz, and Bluetooth® paired with near-field magnetic induction). The results of this study revealed that use of the remote microphone systems statistically improved speech recognition in noise relative to unaided and hearing aid only conditions across all four wireless transmission protocols at 6 and 12 feet away from the talker. These results are consistent with previous remote microphone literature and confirm that remote microphone technologies offer significant benefits in difficult listening conditions when compared to hearing aids alone. This work was presented at the 2014 meeting of the American Auditory Society in Scottsdale, Arizona and published in the Journal of the American Academy of Audiology (2015). Remote microphones provide a wireless direct audio input to hearing aids that overcomes negative effects of talker distance, ambient noise, and reverberation.1 The improvement of speech recognition in noise using remote microphone technology is documented in several studies.2−4 Specifically, Lewis and colleagues investigated the effects of remote microphone technology on speech perception in noise relative to unaided and hearing aid only conditions.3 The investigators recruited a group of participants ranging in age from 24 to 84 years with mild-to-severe hearing loss. Speech recognition performance was assessed with the Hearing in Noise Test in 5 different listening conditions.5 Results revealed that the use of remote microphones significantly improved the signal to noise ratio (SNR) relative to the omnidirectional hearing aids alone by 16 to 22.7 dB, confirming that adult listeners with hearing loss benefit from the use of a personal remote microphone system. The commercially available remote microphone systems that employ different wireless transmission protocols that were used in this study were: (1) a frequency modulated (FM) system; (2) a Bluetooth system coupled with near-field magnetic induction (NFMI); (3) a 2.4 GHz system; and (4) a 900 MHz system. In an FM system, audio is transmitted from a remote microphone to a dedicated FM receiver that is coupled to a hearing aid or soundfield speaker. In the United States, FM remote microphone systems will transmit audio on a carrier frequency that falls around 216 MHz; in Europe, FM remote microphone systems use a 170 MHz carrier frequency. The Bluetooth® system uses a codec to transmit audio directly to a gateway device, commonly worn around the neck. The gateway device then translates the Bluetooth® signal to a proprietary wireless, short range, near-field magnetic induction (NFMI) signal that is sent to hearing aids. The combination of Bluetooth® audio and NFMI audio uses a mixture of carrier frequencies, with the Bluetooth signal being transmitted around 2.4 GHz and the comparatively low-frequency NFMI being transmitted between 5 and 15 MHz. The third remote microphone system used in this study sends audio using a proprietary codec transmitted at 2.4 GHz directly to a radio encased in the hearing aids. The fourth system utilized in this project transmits audio at 900 MHz directly to a receiving radio in the hearing aids. The latter two systems do not require a gateway device to translate the audio signal. While the general behaviour of remote microphone systems has been established in both the audiology and room acoustics literature, it is not clear how patients might benefit from these four commercially available designs. The primary goal of this study was to document the speech recognition benefits of four commercially available remote microphone systems, each using a different method for wireless audio transmission. At the time of fitting, real-ear measurements were completed using an Audioscan Verifit and the International Test Stimulus (ISTS). All participants were fit to DSL v.5 adult targets.6 Stimulus presentation levels included 55 dB SPL and 65 dB SPL for the hearing aid only condition and a 55 dB SPL ISTS signal for the remote microphone only and remote microphone plus hearing aid microphone settings. An omnidirectional hearing aid only fitting to the DSL v.5 adult targets generated by the Audioscan Verifit. Except for feedback suppression, all other features and noise reduction algorithms were deactivated. A remote microphone streaming only setting to the same DSL v.5 adult targets. Except for feedback suppression, all other features and noise reduction algorithms were deactivated. A remote microphone streaming plus hearing aid microphone fitting to the same DSL v. 5 adult targets. The remote microphone and the hearing aid microphone were set such that each contributed equally to the audio signal. Except for feedback suppression, all other features and noise reduction algorithms were deactivated. HINT stimuli consisted of 26, ten-sentence lists combined with speech-spectrum noise. For the purpose of this study, the HINT was used in its adaptive form in which the noise is presented at a fixed level and the sentence levels are varied depending on the accuracy of the listener’s response. The HINT SNR-50, or the signal-to-noise ratio required for correct repetition of 50% of the sentences, was recorded for the hearing aid only, remote microphone only and hearing aid microphone plus remote microphone conditions. Each condition was assessed one time using two lists (20 sentences for each condition). The speech was presented at 0° azimuth and an equally distributed, continuous, speech shaped noise was presented from four speakers surrounding the participant (45°, 135°, 225°, and 315°). The presentation level of the noise was 55 dB SPL. The participants were seated 6 and 12 feet away from the talker loudspeaker. 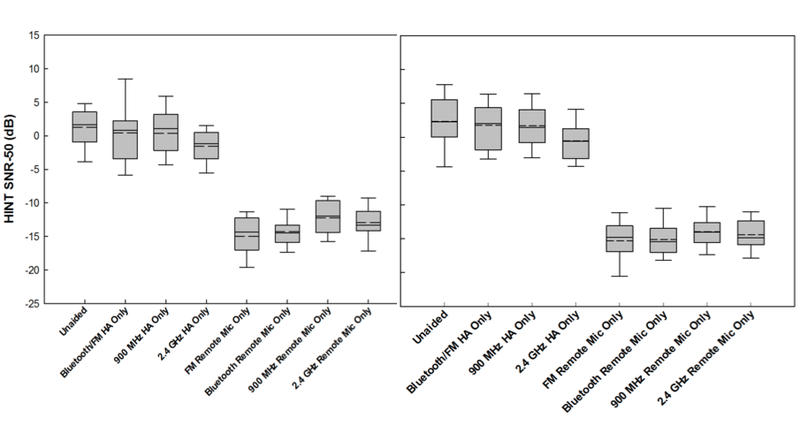 Figure 1 shows a box plot of HINT SNR-50 performance for all remote microphone only conditions (data from six feet away from the loudspeaker are shown on the left and data from 12 feet away are shown on the right). The main effect of microphone condition was examined using a one way repeated measures analysis of variance (RMANOVA) for each distance. Results of the one way RMANOVA showed a significant main effect of microphone condition (p <0.001) for both distances. Post-hoc analysis included a Tukey pairwise multiple comparison test which revealed that all four remote microphone systems significantly improved speech recognition in noise (p <0.001) by 11 to 15 dB when compared to both the unaided and hearing aid only conditions when the participants were seated six feet away from the talker and by 13 to 16.8 dB when the participants were seated 12 feet away from the talker. Figure 1. On the left, HINT SNR-50 is shown as a function of microphone condition (unaided, hearing aid only, and remote microphone only across all four wireless protocols) at 6 feet and on the right, HINT SNR-50 is shown as a function of microphone condition for 12 feet (unaided, hearing aid only, and remote microphone only across all four wireless protocols). Box plot whiskers show the 5th and 95th percentiles, the shaded box shows the 25th and 75th percentiles. Mean (n = 16) SNR-50 is represented by the dotted line inside the box and the median performance is represented by the solid black line inside the box. Figure 2 shows the results of the HINT SNR-50 performance when the hearing aid microphone was enabled at both six feet (left) and twelve feet (right). Results of the one way RMANOVA showed a significant main effect of microphone condition (p <0.001). A pairwise multiple comparison procedure (Tukey) revealed that all four remote microphone systems streaming with the hearing aid microphone enabled significantly improved speech recognition in noise when compared to the unaided and hearing aid only conditions (p <0.001). Performance was similar between the FM, Bluetooth, and 900 MHz remote microphone but with the addition of the hearing aid microphone, the 2.4 GHz system was significantly poorer when compared to the other three systems at both six and 12 feet. Figure 2. The HINT SNR-50 is shown as a function of microphone condition: unaided, hearing aid only, remote microphone plus hearing aid microphone across all four wireless protocols at six feet (left panel) and 12 feet away from the talker (right panel). Box plot whiskers show the 5th and 95th percentiles, the shaded box shows the 25th and 75th percentiles. Mean (n = 16) SNR-50 is represented by the dotted line inside the box and the median performance is represented by the solid black line inside the box. It is important to note that these results were achieved with a 6-inch distance to the remote microphone and the amount of benefit is significantly impacted by the distance between the speaker and the remote microphone.7 When prescribing remote microphones as part of the audiological treatment plan, it is imperative to include this fact in the patient counseling to realize these extreme benefits with any of the four wireless strategies. Lewis DE. Assistive devices for classroom listening: FM systems. Am J Audiol 1994;70−83. Boothroyd A. Hearing aid accessories for adults: The remote FM microphone. Ear Hearing 2004;25(1):22−33. Lewis MS, Crandell CC, Valente M, and Horn JE. Speech perception in noise: Directional microphones versus frequency modulation (FM) systems. J Am Acad Audiol 2004;15:426−39. Fitzpatrick EM, Séguin C, Schramm DR, et al. The benefits of remote microphone technology for adults with cochlear implants. Ear Hear 2009;30(5):590−99. Nilsson M, Soli SD, and Sullivan JA. Development of the Hearing In Noise Test for the measurement of speech reception thresholds in quiet and in noise. J Acoust Soc Amer 1994;95(2):1085−99. Scollie S, Seewald R, Cornelisse L, et al. The Desired Sensation Level multistage input/output algorithm. Trend Amplific 2005;4(9):159−97. American Speech-Language-Hearing Association. Guidelines for fitting and monitoring FM systems. ASHA desk reference. Rockville, MD: Author; 2002. Krishna S. Rodemerk, AuD, is a research audiologist at Starkey Hearing Technologies. Prior to joining Starkey Hearing Technologies, Rodemerk worked in a private practice as a clinical audiologist in Rochester, N.Y. She earned her clinical doctorate from the University at Buffalo, where she also served as a research assistant in the Center for Hearing and Deafness.